Tennesseans Reclaiming Educational Excellence (TREE) is out with an email detailing the latest efforts to pass vouchers at the Tennessee General Assembly. The message is clear: Vouchers don’t work and they’re pretty expensive. The “Ever-Expanding Universe of Vouchers” was a blog post https://treetn.org/expanding-vouche… TREE did last year warning Tennessee about school voucher intentions. In that blog we stated, “Voucher supporters, along with money from outside interests, will stop at nothing to expand voucher programs in Tennessee, effectively creating a privatized black hole for taxpayer dollars. 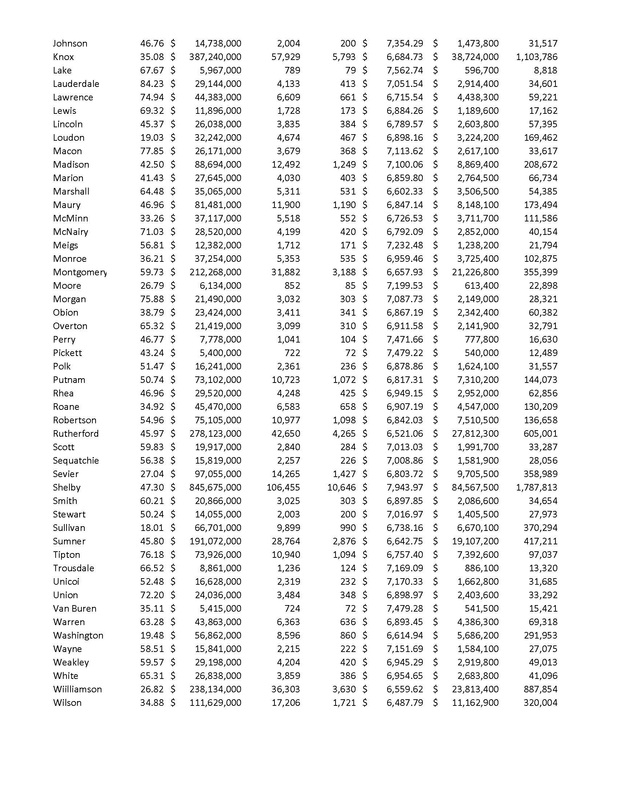 Tennessee ranks 47th in funding for public education, leaving schools to tread water while legislators look for ways to fund private schools.” And where are we AGAIN this year? Fighting back multiple attempts to expand public school vouchers. One bill will expand the TN IEP voucher. Only 38 out of 20k qualifying families bothered to sign up for the current version of this voucher. But, it is not about what families want. It is about expanding. This new version wants to qualify more disabilities to wave their IDEA rights and take the money even though we have no idea if the pilot works. This IEP expansion is modeled after Arizona. The Arizona Legislature created its ESA program in 2011 for special-needs students and has since expanded it to allow children from poor-performing schools, from military families, and others. Watch for this pattern in Tennessee. It is all intentional. The other voucher bill (HB126) left progressing through committee is squarely and unfairly aimed at Memphis as a pilot. And Memphis parents, school boards, and elected officials have not been silent in their objection. Here is what we know about urban pilots. Every time a voucher starts as an urban pilot for a small number of students, it expands across the state. Flashback to charter schools as an urban pilot solution. And now several rural districts are seeing charter school intent letters. The playbook is followed in every state where privatized solutions proliferate. Vouchers will not stop at a pilot. Isn’t the point of a pilot to see if something works? The word pilot is a sham. We don’t even know if the IEP disability pilot is working and it is already expanding. This Memphis pilot bill is stuck on whether it will even use the TNReady to see if the pilot works. How is that fair? How do you show a voucher pilot improves educational outcomes for children if they don’t take TNReady? Then what kind of overreach will we see private school curriculum to make sure “the test” is addressed? It is a slippery slope. Concerns are growing fast as the County Commissioners Association published a spreadsheet (shown above) that TREE obtained via email, sent to Association members outlining a rough idea, county by county illustrating “[H]ow a k-12 voucher program might impact county budgets, particularly if you compare revenue lost when a student transfers out of a school district and into a private school. 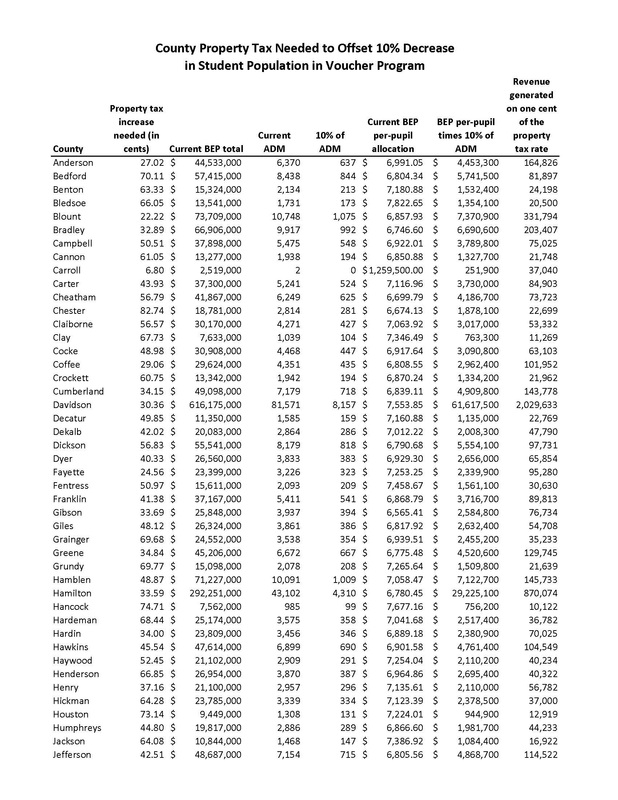 https://drive.google.com/file/d/0B6… ) The chart shows the amount of county property tax needed to offset a 10-percent decrease in student population. [The Association] research has cross-checked many of the systems and, for the most part, it appears to be accurate. ” Of note: Carroll County sets its districts differently, so the formula used does not translate for that county. School vouchers become a parallel school system to fund. One Tennessee cannot afford. Parents feel vouchers are an empty promise. Study after study show they do not work to increase achievement. https://www.brookings.edu/research/… Without transportation and the ability to cover all the extras, a voucher is not really in reach of most public school families. The private schools most familiar won’t be taking vouchers. And in the end, voucher school choice is the choice of the private school to accept a student and to keep a student. It opens the door to discriminatory practices that leave Shelby County parents in doubt this is little more than a religious school subsidy with tax dollars that experiments on their children. Our government needs to invest in neighborhood schools, invest in RTi2 small intervention classes, time with a teacher, community schools coordinators to coordinate wrap-around services and discipline supports. Fund opportunities to engage in learning. Not siphon off public dollars into private, unregulated hands. We must support Shelby County Schools, not public money for vouchers. Former Lt. Governor Ron Ramsey confirmed that he supported intentions to expand the program statewide when he recently spoke to a group of Shelby County Republicans in Bartlett. These pilots are nothing more than seeds for state voucher program growth and higher taxes. In fairness, the Indiana experience has shown about a three percent rate of students taking vouchers. Still, that’d add up to a pretty hefty tax increase in many places. All to support a second school system. The Indiana experience shows that creating a voucher school system means an education funding deficit. This is a key week for vouchers, as the Shelby County pilot bill is going before the House Finance Subcommittee. Stay tuned to see if legislators will advance a voucher scheme.